I've started to implement BFS - expect possible temporary breakage of the more exotic software command paths, this isn't trivial to merge in, there's a lot of states the software could be in that need to be covered somehow (such that BFS can be in a different OPS from PASS). For the GPU you have, framerate would depend mainly on ADI detail and MDU update rate (which you can choose to your liking). 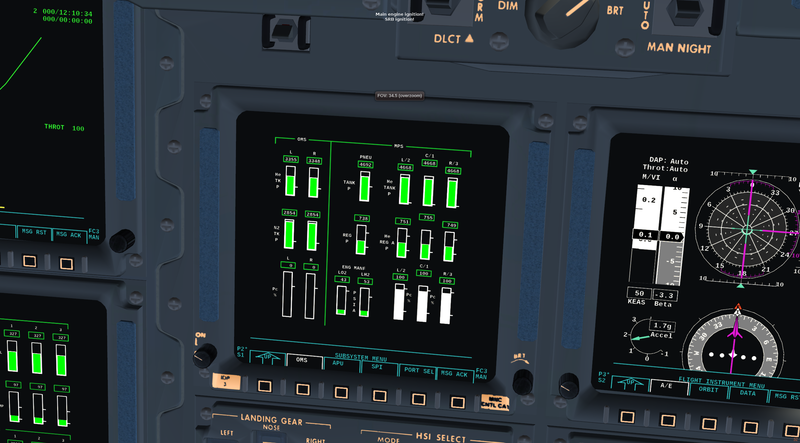 Maintaining 11 displays with (potentially) hundreds of different parameters displayed is unfortunately insanely expensive. With decent detail and update rate, you probably won't get above 40 (at least I don't on a state of the art gaming laptop). 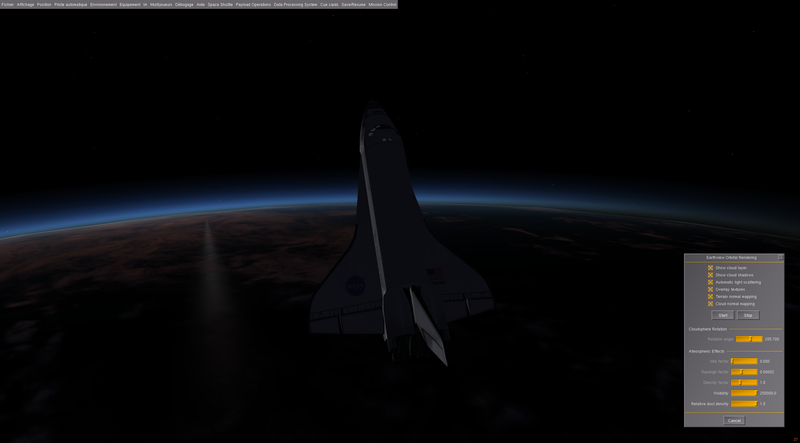 The Shuttle is with some margin the most involved simulation FG has to offer. 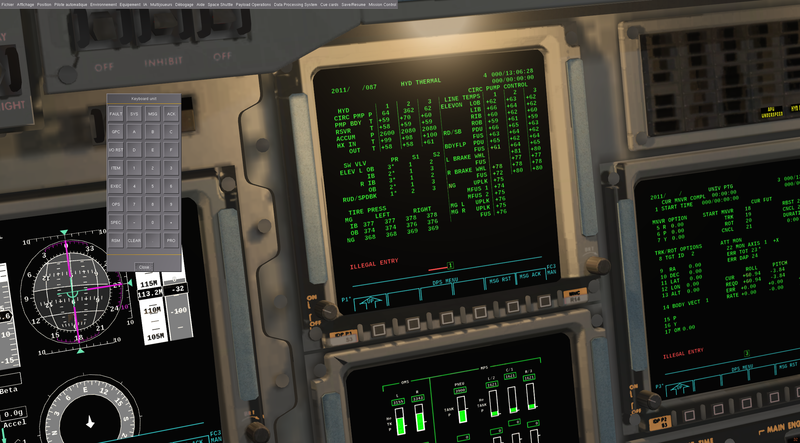 From the menubar View->Rendering - Atmospheric Light scattering on, shader quality level detailed dialog open, everything to max, and you get what I have. Are you actually tracking the devel repository? By the way, how do you do to track the repository and install it in FG? how to get the hires Earth textures. I'll have to admit I have no clue how a Windows GIT client works... Maybe someone else knows, I do this always under Linux. 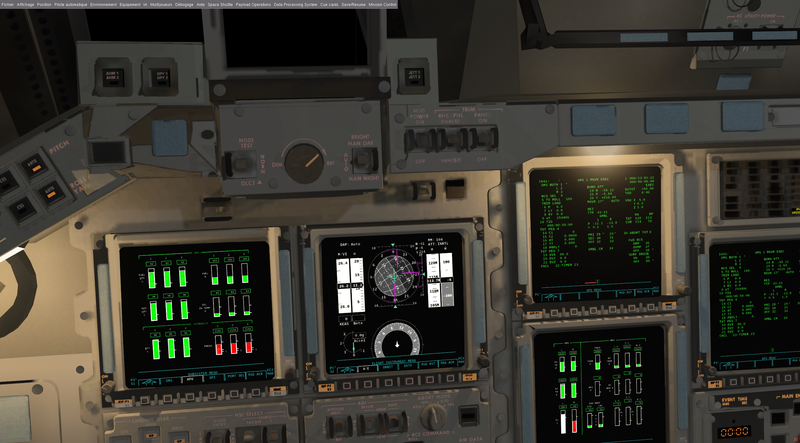 Is there a way to increase texture definitions in the cockpit? 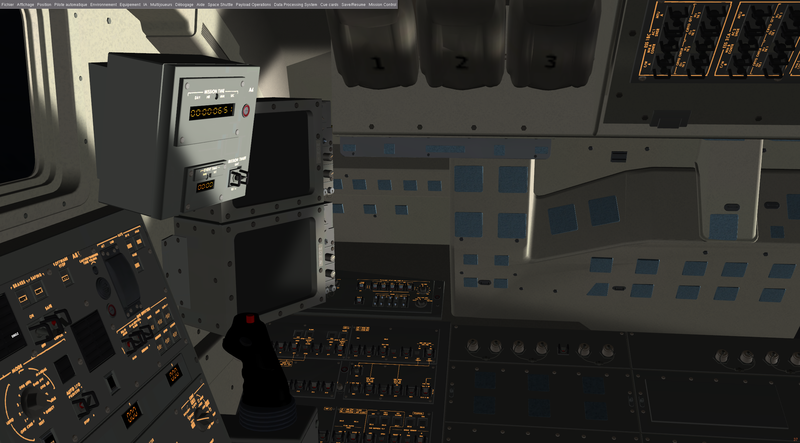 One more thing, When I launch the shuttle, she is not standing no her pad, put below the pad on the ground, any idea? Only if someone provides a GPL-licensed set of hires photographs of the panels and re-does the texturing - even the Gigapan we've been allowed to use has limits. It's two 4k texture sheets crammed full already. 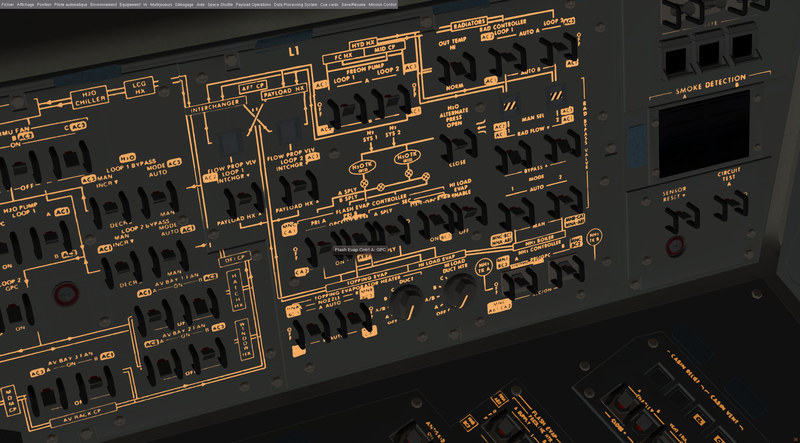 Question, is item 14+5 implemented on OPS 201 to choose the Pitch and Yaw of BPV? No, the pain to gain ratio to enable this is quite large and I really couldn't see the important use case. Fundamentally it's a racing condition - the pad needs to be in the scene before the ground intersection test upon aircraft init is done. I'm just surprised that it happens with your kind of computer... The delay in the code should actually do the trick, unless the queue is full of 3d models to be placed already. Is this happening everywhere / at Boston specifically? What happens if you start paused (launcher provides an option) and unpause later once the sim is running? Thorsten wrote in Thu Jul 20, 2017 6:24 pm: I'll have to admit I have no clue how a Windows GIT client works... Maybe someone else knows, I do this always under Linux. For the launchpad, it seems to work now, sometimes I get the full pad, sometimes not. I am also progressing with my FG knowledge, it's really a fascinating simulation. 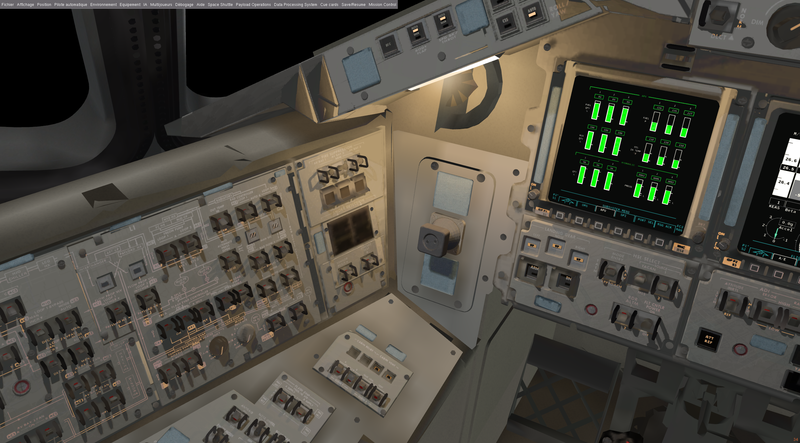 If I understood well, to get the max resolution with Earthview, I have to installed those textures : 16384x16384 7z-zipped: world dds (~310MB) - world png (~1GB) (Warning: Requires much more than 1GB Graphics RAM - FG crashes on my machine with 1GB GRAM) ? Next step will be some higher resolution textures for the ground. 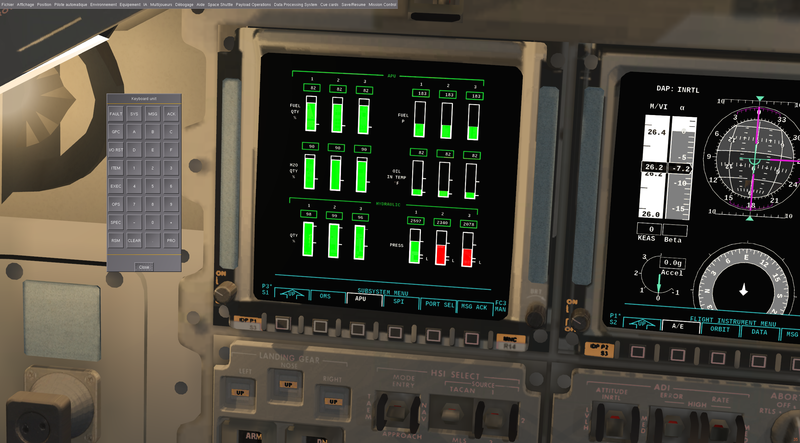 I am also reading ALS technical notes, I activated ALS filter and put shaders to max, do you do something else or is it enough? Also, I didn't have seats during this flight. Nicely done for HUD Cover that we can now remove !! 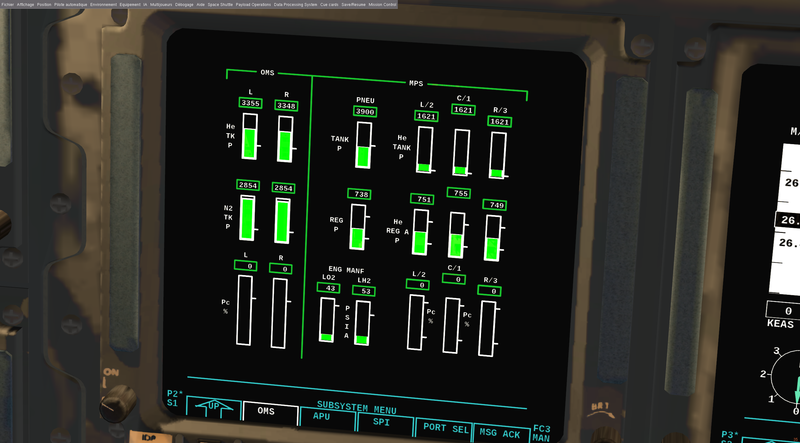 Question Thorsten, Launch Heading was 75° ( confirmed by the virtual FG HUD), is it normal to see a North Heading during launch on the HSI? Orbit is safe, perigee outside of dense atmosphere. And final test for today with the Hydraulics recirculation Pump, really really nice. 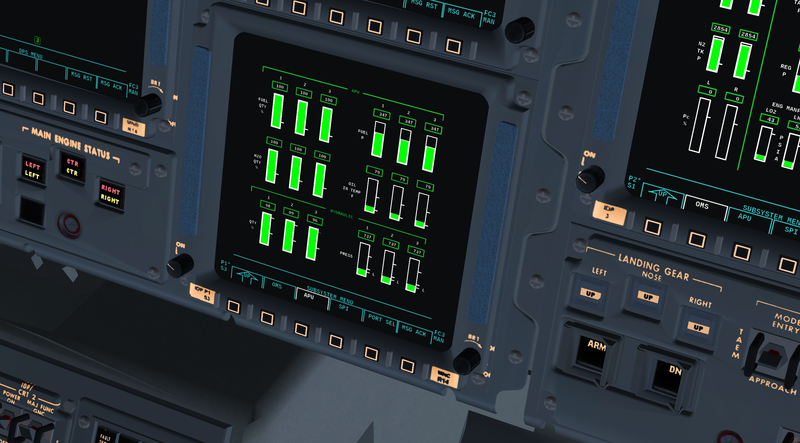 When APU are shut down, hydraulic pressure is kept around 2600 PSI by an accumulator and a differential pressure system to allow circulation and heating of fluid during cold orbit operations. It works really nicely in the simulation, with pump activation to maintain 2600 of pressure in every HYD circuit and recirculation. 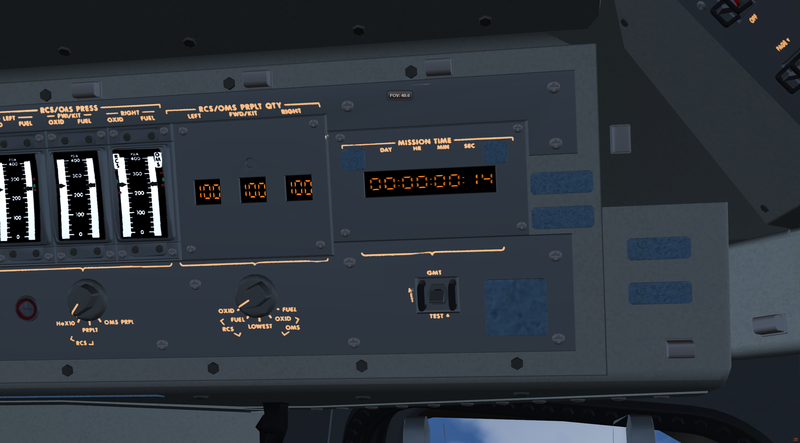 Wow, Two hours of simulation and I didn't see the time goes by. There's 90 (!) GB of terrain (not counting the city building overlays which are by now another 10 GB if you install all), most of which you haven't installed. Non-installed terrain is represented by water. 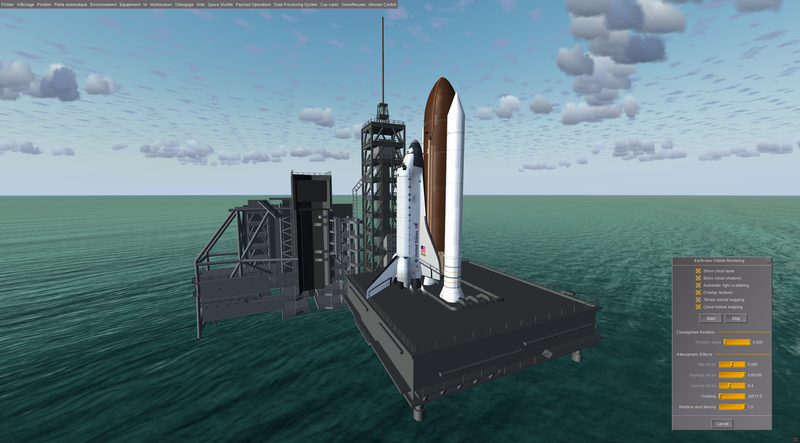 You need to install KSC (and any landing sites you want to use) - usually you'd simply activate terrasync (automatic scenery download) which downloads it as you overfly the place - but the Shuttle is too fast for the server to keep up. 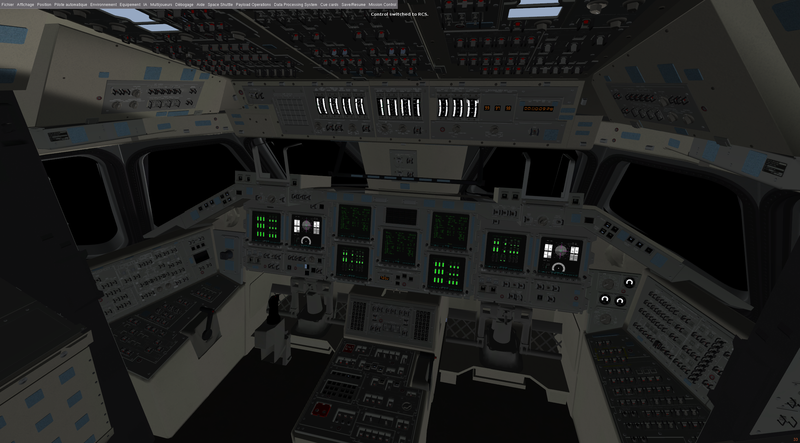 So you need to pre-fetch it - either by starting with the ufo at KSC with automatic download enabled, or by using a tool like TerraMaster. I'm not 100% sure, but I seem to remember the HSI shows deviations to the desired trajectory, not absolute course. 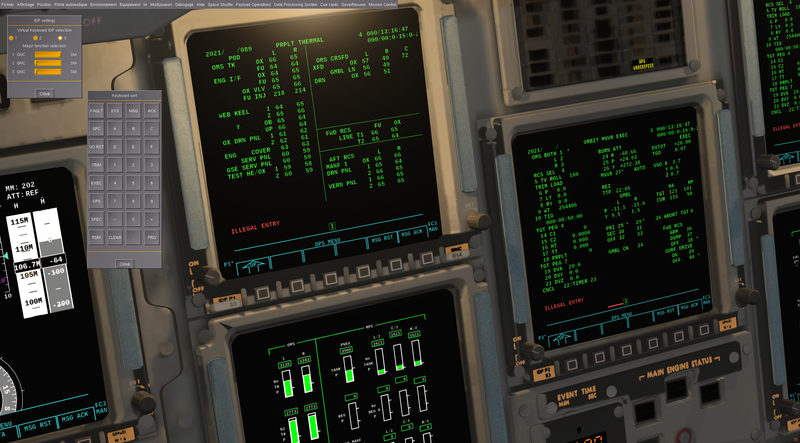 Need to check, it might be a bug after all, the PFD is a very dense display with lots of items changing their function all the time. During night, I usually prefer panel and center console lights only. It's probably the heaters after all - the logic isn't 'heaters on, burn okay', it's 'temperature okay, burn okay' - and they're connected to an actual thermal model, so they might need a few minutes to heat the lines enough. You'd need to check line temperatures on SM SPEC 89 to be sure, temperatures there are really simulated. Ok, so let's see if I understand well the process. 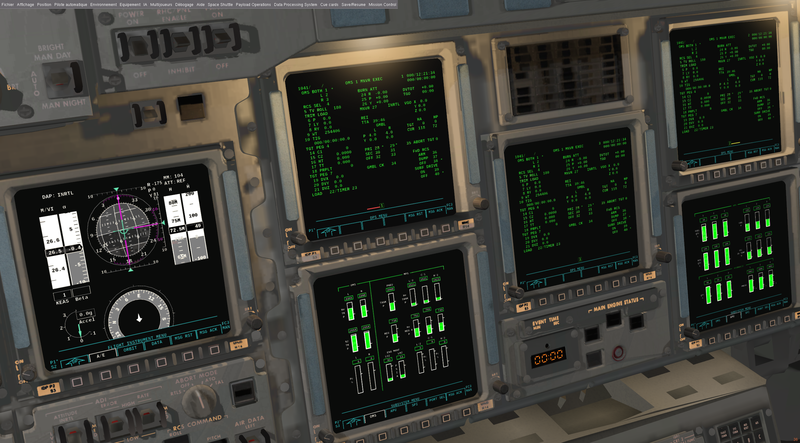 I need to download textures and HD tiles for let's say KSC, Edwards, and all TAL or destinations where I will go. Then when I am above let's say 120000 feet, I switch to Earth view and come back to ground normal view for TAEM, so I don't need to download too much HD tiles ? Is it that link http://ns334561.ip-5-196-65.eu/~fgscenery/WS2.0/scenery-2.0.1.html ? Do I need to download airports in addition of global tiles? Even with early Earth view activation Terra Sync is lost and can't catch up? Actually I am pretty sure you are totally right with the HSI, it has to be deviation from projected track. I will have a look also. 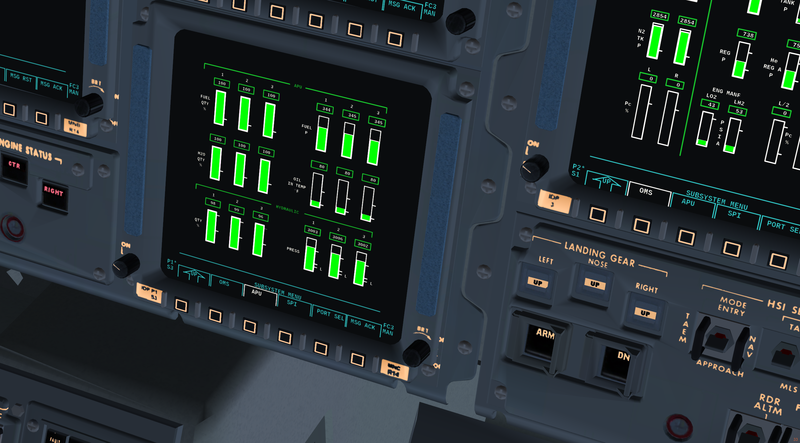 Ok, I will check more carefully the thermal control of OMS/RCS. 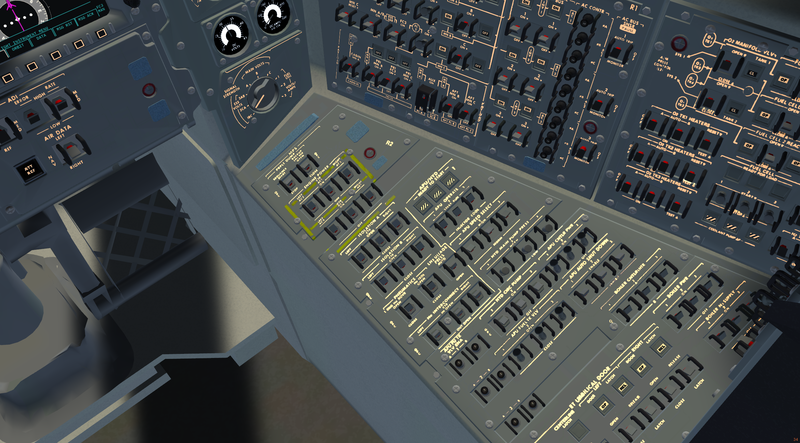 I also tried some RTLS, hell of a job with the open loop guidance. 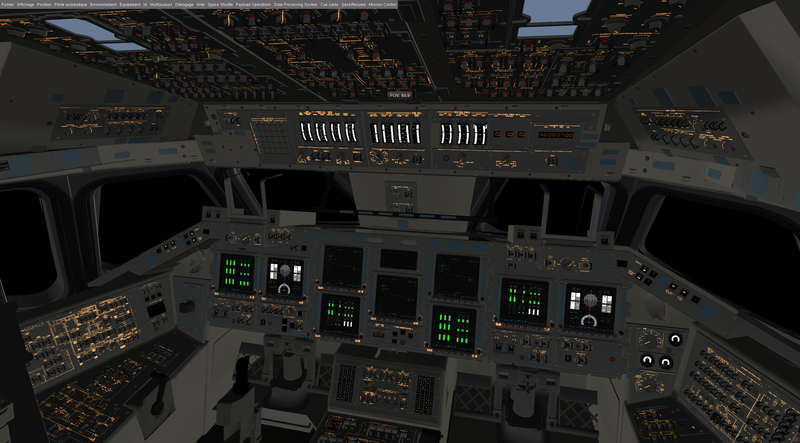 Nice to have Spec 51, I tried OMS to RCS dump, playing with max, nominal abort thrust, etc. I never followed FDF so much. Also, I had a quick look on Kalmann Filters you implemented during GRTLS, need a bit of tech refreshing with entry workbook, but really cool. At heart, FG is a flightsim, assuming you're sedately flying with your C-172p at 70 kt across the scenery. That's what the infrastructure is designed to handle. There is no basic lowres Earth like you'd get in Orbiter which you can upgrade with hires tiles close to landing sites. 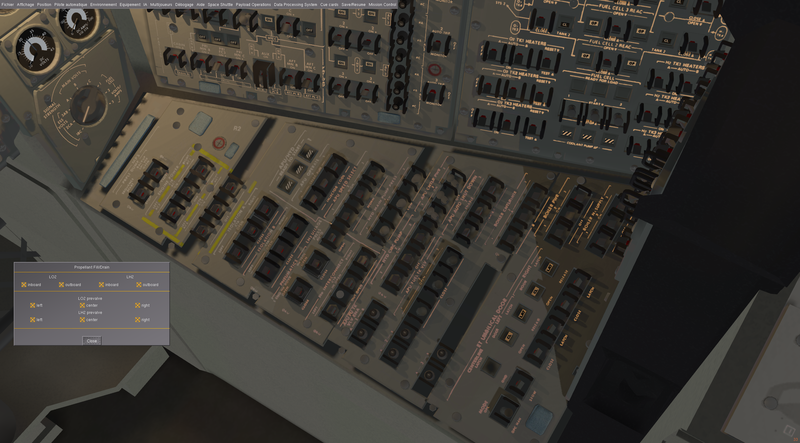 The terrain mesh contains elevation and landclass data as well as major roads and airports (what you need for VFR flight) and that's all there is, where it's not installed there will be ocean. 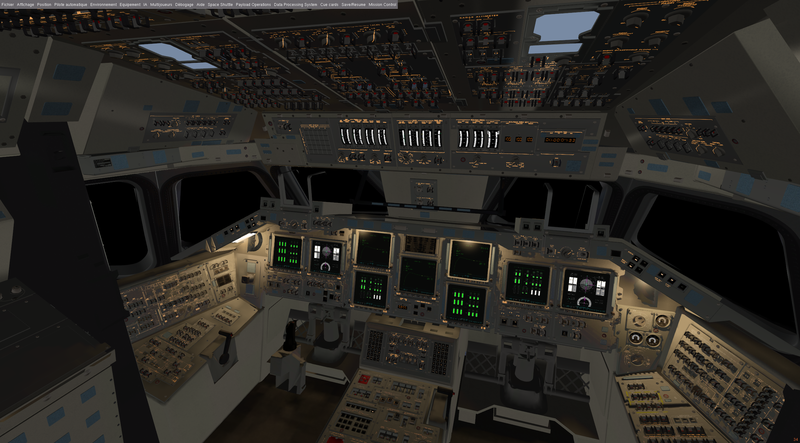 There's no hires patches installable around Shuttle landing sites, the resolution is similar across the world (~ 100 m feature scale around the world, ~10 m in Europe where there's CORINE landcover data) and procedural texturing generates the smallest features at around 10 cm size - regardless of where you are. (Terrain doesn't look equally pretty everywhere, if it got personal attention by someone it looks a lot better than automatically generated and textured terrain). Thus, if you do install the whole world, you'll be able to see ~20.000+ airports at roughly the same resolution and be able to land at all major ones. 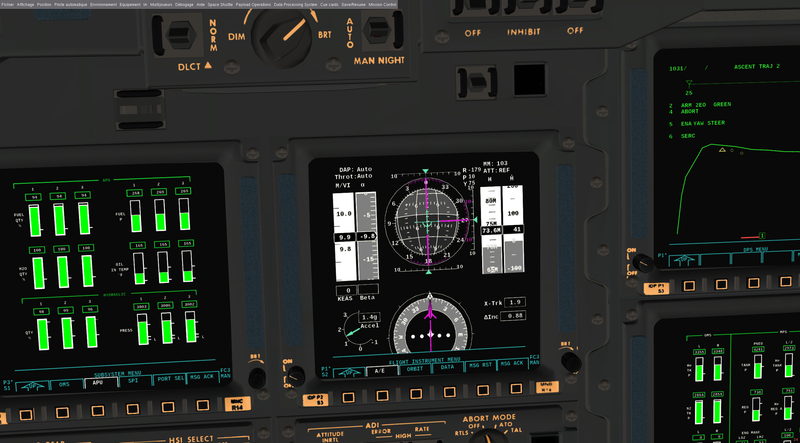 The idea is that as your C-172p takes off and flies, FG can gradually download the terrain on the horizon so by the time you get there, it's on your harddisk. But in case you have a slow connection, there's fallbacks to download it all offline. 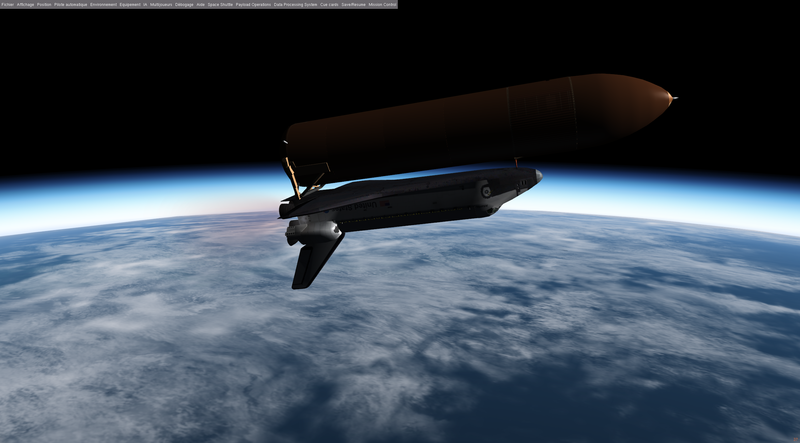 Now, the Shuttle is a lot faster than 70 kt, so it will almost certainly be able to out-race your internet connection, so the scenery has to be pre-fetched, or FG will still be busy downloading Florida by the time you reach Africa. Earthview on the other hand is rendered 'on top' of the base terrain mesh (which isn't actually loaded from orbit). You can't land on it, you'll simply fly through it and see the normal terrain underneath. 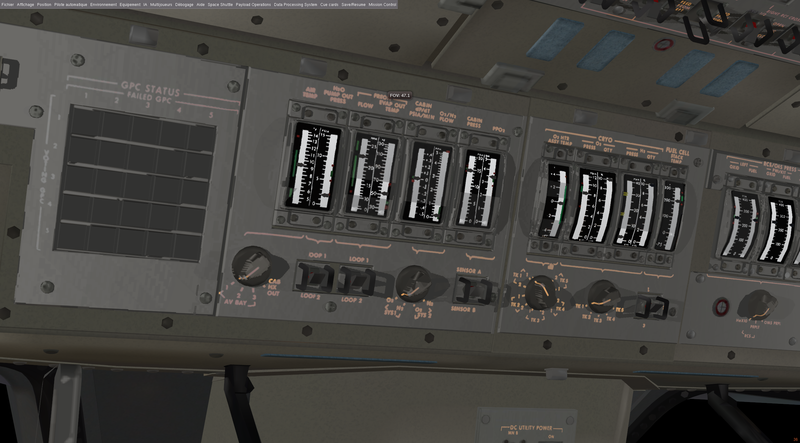 It's only designed for use from high altitude (I typically switch it on at 85.000 ft at TAEM interface). It doesn't really know about or interact with the normal terrain. Also, Earthview will render a cloud layer, but the normal terrain will have actual weather that can be synchronized with real weather around the planet. So you can approach a cloud-free region in Earthview, but you're not guaranteed to have no clouds for your landing, that depends on weather manager settings. Got it for the textures, I gonna download directly the tiles I want and put it into the game. I saw your screen concerning Earthview, really great. 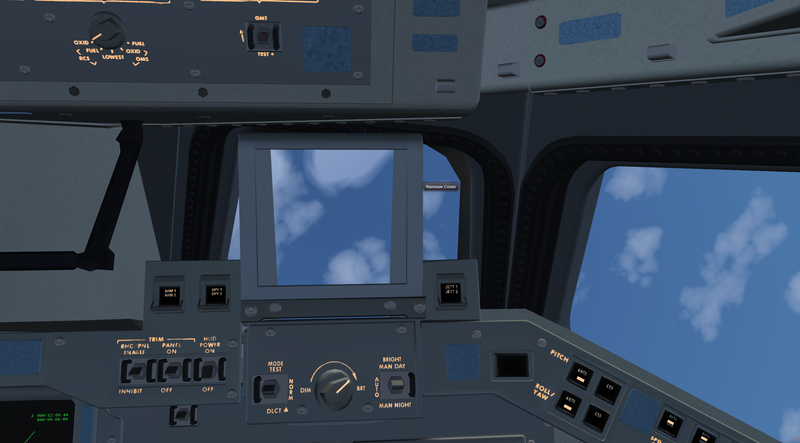 So to have the max resolution, I take the clouds in 8192x8192 and the world in 16384x16384 ? Should I use dds or png for the world ?